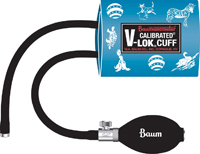 Our Non-Latex Calibrated® V-Lok® Inflation System provides a high quality alternative for patients and practitioners who are hypersensitive to natural rubber Latex. The inflation bulb and bag are a special blend of Neoprene that is resistant to attack from ozone, acids, bases, alcohols, and various hydrocarbons, while retaining the feel and function of our standard natural rubber Latex parts. Their distinctive terra-cotta color will make them easy to identify. The Air-Flo® Control Valve body and air release mechanism are precision machined brass, nickel and chrome plated. Air entering the system is regulated by a resilient valve tip of specially formulated silicone rubber designed for quick recovery and resistance to distortion and aging. Three key interior parts: the relief pin, the relief spring, and the valve spring itself are made of stainless steel for corrosion-free, non-stick operation.